It’s been several years since an early wave of innovators began investing in digital technologies to improve quality. 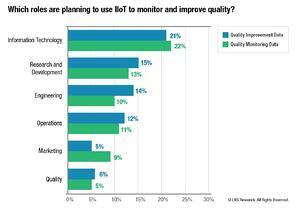 In fact, quality improvement and improved quality monitoring are one of the top use cases for Industry 4.0. The ranks of digital, IT, operations, product development, and quality leaders focusing their digital energies and resources on quality improvement is quickly growing. After defining the space and working with innovative manufacturers on their Quality 4.0 journey, the most common question I get today is: “what have early adopters already done, and how can I learn from them?” Here are some broad concepts that early adopters have gotten right. Industrial Transformation, including Industry 4.0, Smart Manufacturing, and others is a proactive and coordinated approach to leverage digital technologies and create step-change improvement in industrial operations. This means that technology, data, and insights are essential enablers, but so are culture, process, leadership, collaboration, etc. 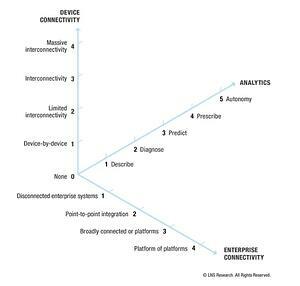 Like the Quality 4.0 “wheel” highlights, there are many elements in Industrial Transformation. Thinking of total corporate-wide transformation all at once is a lot. Various approaches have been successfully adopted to transform. Some establish baselines that create uniform capabilities across plants (“rising tides” lift all ships), others establish “lighthouse” operations as exemplars, and yet others build upon established strengths as “beachheads” and extend the benefit of these beachheads through the organization. Whatever the approach, it's important to work in a cross-functional way, with support from leadership, and focus on quickly delivering business value vs. deploying the technology. It's no secret that while some organizations have done an excellent job of deploying highly integrated technology architectures that deliver data and insights with low latency across the globe, most are not in that state. One area that is often relatively easy to improve upon is visibility to quality data and automation of quality processes. Quality has historically received low rates of IT support: enterprise quality management software (EQMS) is adopted by just 23% of the market, and when adopted, is usually siloed. A median of 16% of processes is integrated with other enterprise systems. Digital technologies are powerful tools and when used correctly they can connect not just IT systems but also assets, people, and products. 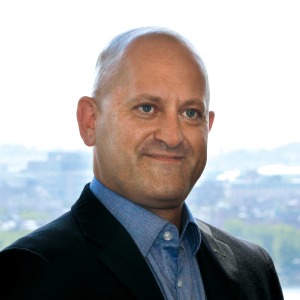 However, the risk is that the silos of yesteryear are digitally replicated, squandering transformation opportunities. One concept that helps with this is “use case plots,” which is used to map the capabilities deployed in the operational theatre and the enterprise software theatre, in combination with analytics/insights. They are used to understand today’s As-Is state and map to a transformative future state. For instance, firms can leverage use case plots to grow from a low-capability environment to individually connected manufacturing assets to predictive product quality; then from predictive product quality to predictive customer experiences. 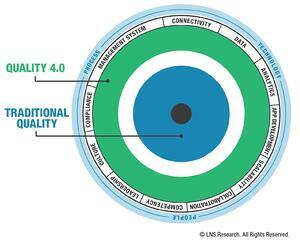 There are many Quality 4.0 use cases, across the value chain. Quality touches the product, people, customers, service, and suppliers. While the quality department owns processes and rich quality competencies, quality and quality improvement belong to the organization. In fact, for every one person with a quality title working on Quality 4.0, there are 19 others, including IT, operations and operational tech, product development, and marketing. There is growing adoption of use cases associated with the online marketplace and social media, warranty data, customer complaints, predictive quality in operations, supplier quality, robotic process automation, connected users (worker/patient/user), connected product, etc. 31 Quality 4.0 use cases are growing in adoption today. If your organization is a software vendor, software reseller, integrator, publisher, or association, please do not complete the survey; instead, contact LNS to learn more.